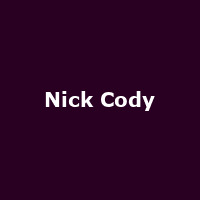 Nick Cody is an Australian comedian, hailed as a "must see" act at the 2015 Edinburgh Fringe. "His 2015/16 show 'Beard Game Strong' has already enjoyed sell-out shows in Melbourne, Sydney, Los Angeles, New York and Edinburgh. Cody is fast becoming a globally sought-after act - supporting international superstars such as Jim Jefferies and Bill Burr, with fantastic reviews and requests to play every major comedy festival, including the Montreal Just for Laughs festival."